I wore two different shoes while sending ‘Silence’: a Miura on the left foot and a Solution on the right one. As a whole, I prefer soft, bow-legged shoes for a decidedly overhanging route, so I immediately opted for either a Skwama or a Solution. Although I’m happy with both models, the Solution felt better, so I followed my gut instinct and wore it on my right foot. As for my left foot, studying the crux required several years of attempts while trying to see which model would have fared better for that specific footwork, in itself playing a vital role in linking the following movements. Failing to achieve the perfect sequence meant that carrying on from then onwards was impossible. I needed something precise, reliable and quite stiff. I tried several different shoes, but the Miura was the only one to cut the mustard. Footwork gave me a hard time. I thought my footwork was quite good, as I am used to standing on dreadful footholds, but the ones you find in Yosemite are a different kettle of fish. In a nutshell: if a route is even just slightly overhanging, you won’t place all your weight on your feet, and 99% of F9a routes are overhanging. As it happens, in Yosemite you put all your weight on very small razorblades pretty much all the time. You have to do that, because the holds are simply too poor to hang on to. Even more crucial is the fact that you do so for hours on end. 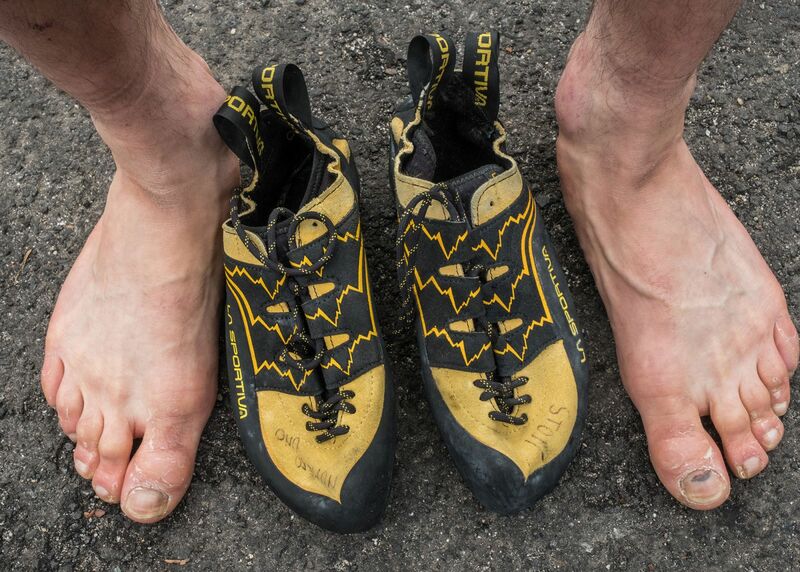 Those razorblades put on such a tremendous pressure on the very few mm of rubber held by your climbing shoes, and it is so strong that they can tear them apart. I tried every climbing shoe under the sun and they all felt too soft. All apart from Katana Laces: they were the only ones which fit perfectly. Still, I had to resort to using sandpaper and razorblades to sharpen the edges of my shoes after a couple of attempts. I would cut the edges at the end of each climbing day. During a day I would use two or three pairs of shoes, which I alternated so as not to wreck them in sweat. I must have destroyed seven pairs or so during the entire trip.